Are you using We Heart it? Would you like to learn how to get started with We Heart it? 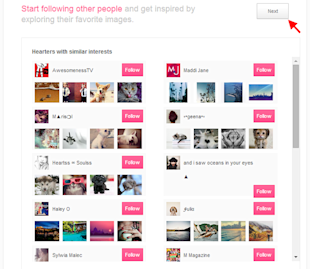 We Heart It is a social network which appears like a mix between Pinterest and Tumblr. It’s actually more like Pinterest than Tumblr. Before you take a brief look at it and dismiss it off as one of the many Pinterest clones created with easily available software, take a closer look at when it was founded. 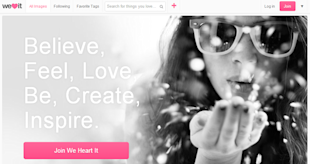 We Heart It Was founded in 2008, 2 years before Pinterest. In fact, in July 2011 We Heart It had 7.7 million unique and 460 million page views compared to Pinterest’s 1.5 million unique and 91 million page views. After that Pinterest had a massive spurt in growth which helped it gain many more millions of users. At the moment Pinterest has more than 70 million users, compared to We Heart It’s 25 million. But We Heart It continues to grow at a nice pace and it is being called the next big social network. So if you aren’t using it yet, you should get on it now (and at least give it a try). Who can use We Heart It? Anyone or any business using visuals or would like use visuals to reach their audience will find We Heart It very effective. The audience here is very similar to that on Tumblr as they are very young. According to We Heart It’s CEO Ranah Edelin, 80% of the users are below 24 and more than 50% of the users are in their teens. Recently the company formed partnerships with Conde Nast and Teen Vogue, two publishing media that reach young readers. Also, just like on Pinterest, a high percentage of the users (70%) are women. 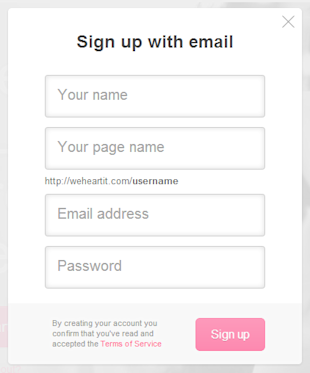 How to set up a We Heart It account? I am now going to show you how to get started with We Heart It. 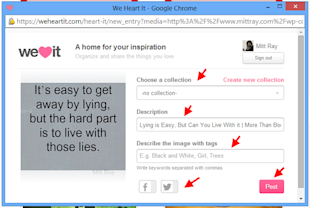 I will first show you how to easily set up a We Heart It account. As I show you how to get started with We Heart It I will be referencing Pinterest, wherever necessary, as you will notice that there are many similarities between them. I am assuming that you already know about Pinterest. If you don’t know much about Pinterest and would like to learn about it, then you can check out our free Pinterest Marketing Video Tutorial where you can learn how to set up a Pinterest account, how to use it at the beginning and how to promote yourself with it. This will give you some ideas about what Pinterest is and how to use it. 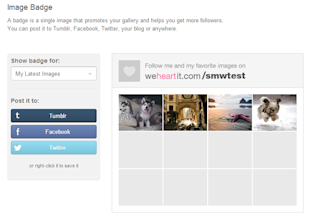 You can implement the same techniques, tips and ideas while using We Heart It. The simplest way to set up a We Heart It account is by signing up with your Facebook or Twitter or Google+ account, just like you might have done on Pinterest. This will be a lot easier as the details found on those accounts will be automatically added to your We Heart It account. This includes things like your profile picture, bio, address, etc. First visit the We Heart It home page. On the top right corner you will see a pink ‘Join’ button. Scroll over it. 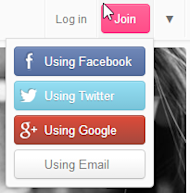 A drop down menu will appear which will prompt you to join them using Facebook, Twitter, Google+ or email. You can choose your favourite way. As I am showing you how to do it with email, I will choose it. A form will pop up on your screen and you can add your details to it. First, add your name, then your page name (which is also the name that will appear in your URL), then the email address you would like to use and finally your password. The name you add will automatically be made into your page name, but you can change that by adding a different page name if you would like to. After you fill in all your details, read the terms of service and click on the pink ‘Sign Up’ button. 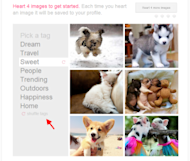 As soon as you click Sign Up, We Heart It will direct you to a page, where it will ask you to heart four images. You can do this by clicking on the heart button that appears when you scroll over an image. 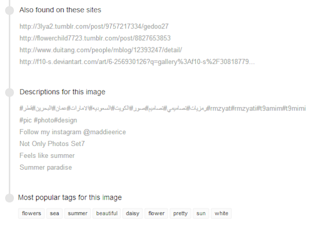 You can also browse through your favourite tags before you heart an image. If you don’t like the tags that are currently available, you can change them by asking for new ones by clicking on the ‘shuffle tags’ option which can be found below the tags. There’s a pink refresh like sign right next to it. After you heart 4 images, a next button will appear on the top right corner. Now click on it. 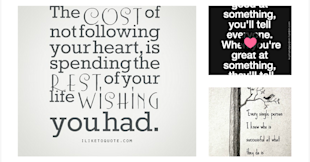 Based on the images you have hearted, We Heart It will find people with similar interest so that you can follow them. Follow anyone you would like to and click ‘Next’. Your We Heart It Profile is ready for use now. There’s one more thing you need to do to complete your profile. This is to add your profile picture, bio, cover image, etc. To fill the rest of your details, scroll over the profile picture thumbnail on the top right corner of your profile and then click on ‘Settings’ which appears on the drop down menu. In the form that appears add your bio, your location and website address. Write a short bio where you describe yourself, what you or your business does, your favourite things and what you plan to share on We Heart It. You can then save the changes you have made by clicking on the pink ‘Save changes’ button at the bottom. After you save your changes, you can make more changes by using the tabs at the top. You can set your account privacy, add your profile picture and edit the notifications you would like to receive. The next step you need to take is to link your Facebook and Twitter accounts by using the options to the right. After you connect your accounts, you can find your Facebook and Twitter friends on We Heart It and follow them. 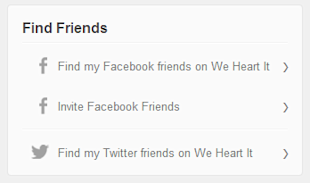 You can also invite your Facebook friends to We Heart It if they aren’t registered. 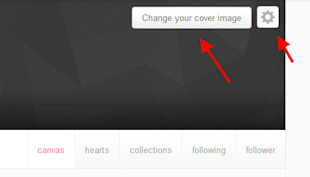 After filling in all your details you can also add a cover Image, by clicking on the ‘Change Your Cover Image’ button which can be found at the top corner of your canvas (profile home page). You can edit your settings too by clicking on the tool option. This should set up your entire profile. Now I am going to teach you how to use We Heart It’s Goodies. To visit the goodies page, visit the settings page first and then click on Goodies. Here you will have many wonderful things that could be beneficial for you and your blog/website. Almost all of them are actually beneficial for blog and website owners. But one thing every user might benefit from is the ‘Heart Button for your browser’ which can be found at the bottom of the goodies page. This is very similar to the Pinterest, ‘Pin It’ bookmarklet as it makes it easy for you to share an image from any webpage. To install it, just click on the pink ‘Install the Heart Button’ and it will be installed. A pink heart button will appear on the top right corner of your browser as soon as it is installed. The next time you want to heart an image from a website or blog you can just use this heart button. The Heart It button for websites: This is a share button that you can add to your webpages and blog posts. You have got various designs with and without share count that you can try out. You can also create a custom We Heart It button using a custom image if you would like to. These buttons should help you build a good presence on We Heart It. How to Get Started With Using We Heart It? Now that you have created a We Heart It account and have optimized your blog/website for it, I am going to show you how to use it. You will learn how to navigate through the site and how to heart images properly in this section. 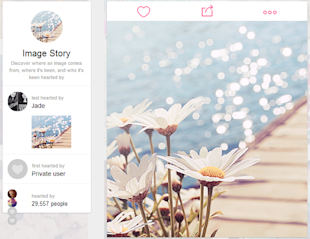 On We Heart It your profile is called a canvas. You can visit it by clicking on your profile picture thumbnail in the top right corner. 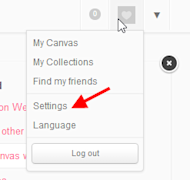 You can also visit the canvas by clicking on ‘My Canvas’ which appears on the drop down menu, when you scroll over the same thumbnail image. At the top of the Canvas, right below the profile picture and cover image, you will be able to see all the collections you or the person who owns the account has. A collection on We Heart It is equivalent to a board on Pinterest. The images you heart on We Heart It will be added to the selected collections. You can browse through the various collections by using the arrows on the sides. Right below your collections, you will be able to see the latest hearts. You can also view hearts and collections separately by using the tabs at the top of your profile. (right below the cover image). You can also use these tabs to see who is following you and who you are following. 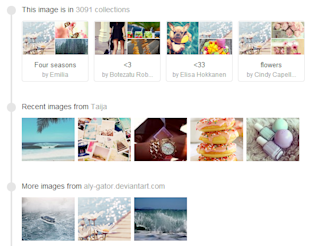 To create a new collection on We Heart It, first visit the collections tab by clicking on it. 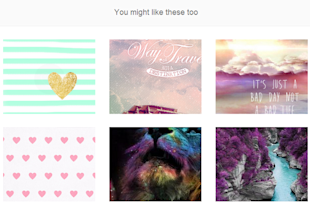 To create a new collection on We Heart It just click on the box with the big plus sign in the centre. A field will appear at the bottom. In this field add the name of the box and click the green tick mark and the We Heart It collection will be created. It’s that simple. There’s no need to add categories, descriptions, contributors, etc. like you do on Pinterest. 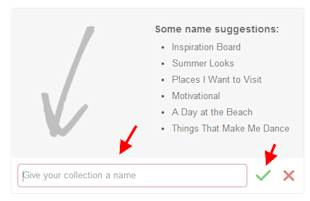 You can change the name of a collection on We Heart It by visiting the collection first by clicking on it, and then clicking on the edit button on the top right corner. In the field that appears, you can type in your new collection name and confirm the change by clicking on the green tick mark. You can also delete the collection by clicking on the red ‘delete this collection’ button. 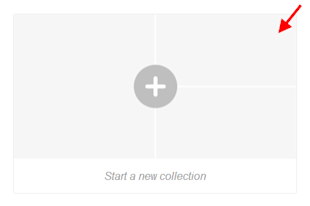 Another thing you can try out is to share the collection on other social media. 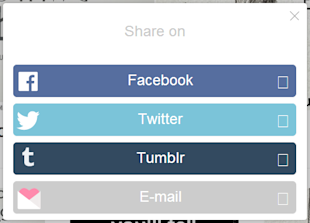 This can be done by clicking on the share button, which can be found right next to the edit button. If you have a new We Heart It collection or account, this will help you spread the word on other social networks. You have four feeds on We Heart It. These are the All Images feed, the following feed, the search feed and favorite tags. 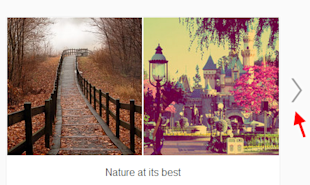 In the All Images feed you can see all the images being shared on We Heart It. This is actually very similar to the Everything feed on Pinterest. In the following feed you can see images hearted by people you follow. In the search feed, things you have searched for appear. The most interesting feed is the favorite tags feed. In the favorite tags feed you can add your favourite tags in the field provided on the right side and We Heart It will help you find hearts and collections based on these tags and keywords. This is a nice way for you to find images you like quickly. So add tags you find most relevant here and you will be able to view interesting images to heart easily. You can easily heart an image from a website or blog onto We Heart It by clicking the We Heart It button you installed onto your browser earlier. Just click on it when you want to share an image from that page. This will get an array of images to appear (the number of images that appear depends on the number of images on that page). You can heart your favourite images by clicking on them. After that a new window will appear in which you can choose the collection you would like to add the image to. Also add a description and relevant tags. You can also choose whether you would like to have these posted on Facebook and Twitter too. Once you have performed all the above steps, you can add the image to your collection by clicking on the pink ‘Post’ button. You can also add an image from a URL or upload an image by scrolling over the pink plus sign at the top and choosing the appropriate options that appear in the drop down menu. You can heart an image directly on We Heart It itself, by clicking on the heart sign that appears when you scroll over it (you can be sure that the image has been hearted when the entire heart fills up with a pink colour). The name of the person who hearted it can be seen at the top of the image. Right next to their name will be a pink ‘Follow’ button. On the bottom left side of the image will be an icon which shows how many people hearted it. You can click on it and see the people who hearted it. You can click on the share button on the bottom right of the image and share it on other social media. Clicking on the ‘i’ which is inside the circle (you can see it at the centre of the bottom of the image, sandwiched between the who hearted it and share button) will give you more details about the image. The details on the left side of the expanded image will display the last person who hearted it, the first person who hearted it and total number of people who hearted it. If you scroll below, you will be able to see even more details like the collections this image has been added to, more images hearted by the person who last pinned this image, more images from the website this image was hearted from, other sites this image can be found on, the different descriptions people used while hearting this image and the most popular tags used for this image. And below all these details you can view similar images you might like. Instead of clicking on any of the options available above like the details icon, who hearted it, heart it, etc. if you just click on the image when the magnify icon appears, (it appears when you place the cursor around the heart sign) the entire image will expand. You will be able to view the all the details about the image on the left side and below the image, like I showed you earlier. You can use the icons present at the top of the image to heart it, share it on other networks, to find the image source (if it was pinned from another website) and to use the image as your cover image. 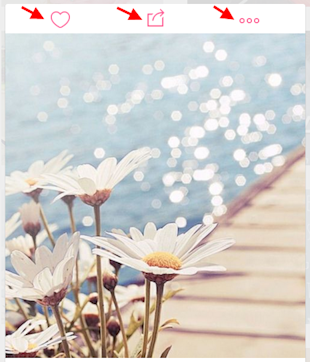 The options to find the image source or to set it as the cover image can be found in the drop down menu that shows up when you scroll over the three pink dots icon on the top right side of the image. Clicking on the expanded image can also help you find the image source. 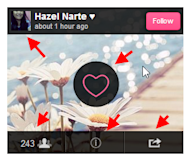 The notifications icon on We Heart It is very similar to that on Pinterest. You can see it here at top right corner, right next to your profile picture thumbnail. It turns pink when you have a notification, which could indicate that someone has hearted your image or followed you. The number indicated the number of notifications. If it is grey in colour and the number is zero it means that there are no notifications. When the notifications icon turns pink, just scroll over it. A drop down menu will appear which will show you the notifications. You can click each of them and view them in much more detail. 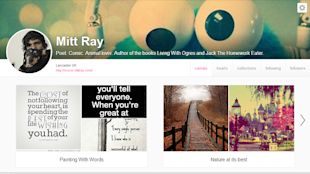 I think I have covered everything that is necessary in getting started with using We Heart It. So use the tips above to create a really good We Heart It profile and build your presence with it. 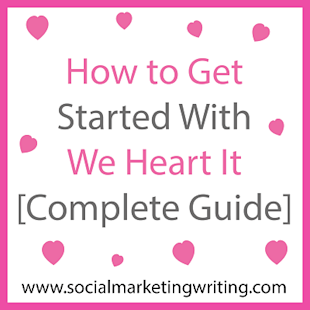 What do you think about the above guide on how to get started with We Heart It? Did I forget to list out any important features and tips on how to make the most of them? Please leave your comments below. If you found this article on how to get started with We Heart It helpful and think your friends and followers will too, please share it with them by using the share buttons below.